Eve is not a terrible read, but it is what I like to think of as "meh." I don't really have any love/hate feelings for it. I think I'm just getting tired of dystopian novels. Perhaps if I'd read this book a couple years ago, I'd have enjoyed it more. But I was annoyed by the extremely naïve main character and the lack of world-building. The story starts off pretty well. The letter from Eve's mom at the beginning is very sweet and heartbreaking, and I enjoyed the prologue. I even highlighted a quote I liked on my Kindle. However, after the first few chapters, my interest started fading. 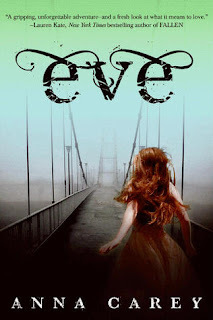 I got seriously annoyed with the main character, the shockingly naïve Eve. Oh, Eve. Where do I start? Many reviewers have pointed to this example, and it definitely made me annoyed, too. In the first quarter of the book, Eve is out in the wild and stumbles across a bear cub, and she thinks it looks like Winnie the Pooh, so she decides to pet it. Because that's such a smart idea, right? I just wanted to shake some sense into her. After that scene, I pretty much lost hope for Eve. I know it's part of her character - that she was raised to be very innocent and naïve - but I just felt like she didn't have enough strength in her character to make me admire her. I kept thinking of her as a little girl instead of a teenager, which made the romance really awkward. Yeah...the romance. What does Caleb see in Eve? Thankfully there was no insta-love, but it still didn't make sense for him to fall in love with her. I also thought Caleb was a bit too perfect at times. Sure, he's nice and sweet, but...that's all he is. It made him a very bland character. And no, I am NOT trying to say that I don't like "good guys," because I much prefer "good guys" to the "bad boy" type. I just wish he had more of a personality. There's also the lack of world-building. I had so many questions I wanted explained, and I found the ending left me unsatisfied. It felt like hardly anything happened plot-wise. I've heard that the world-building improves later on in the series, but I don't really think I'm interested enough to pick up the sequel, unless I happen to see it at my library. I know some of my friends have enjoyed Eve. It just wasn't a great read for me.